Put a bridge, water-absorbing plants, custom rain gauges, and water level markings on it! 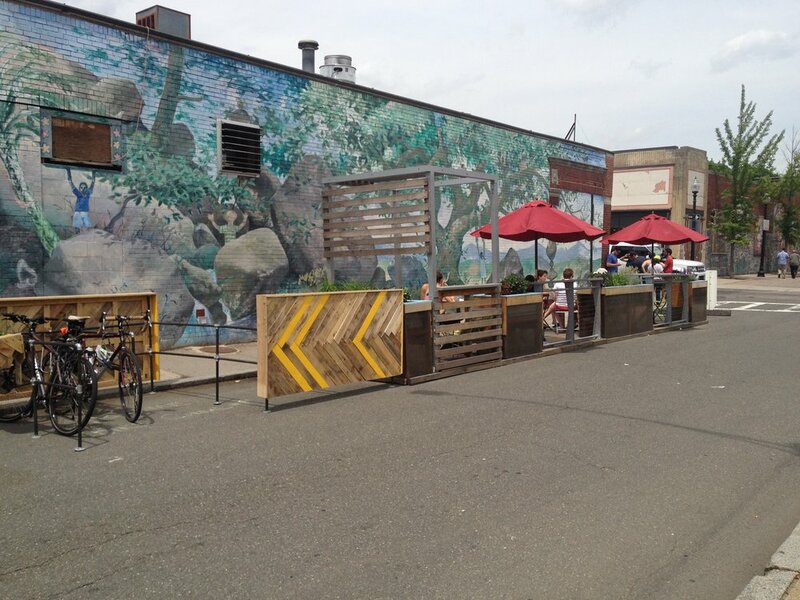 After: A market scene can be possible with the extended boardwalk in the longer term vision. Here, custom rain gauges can be seen built into the railing. Colorful grates mark the boardwalk so visitors can look down to see the plants below. 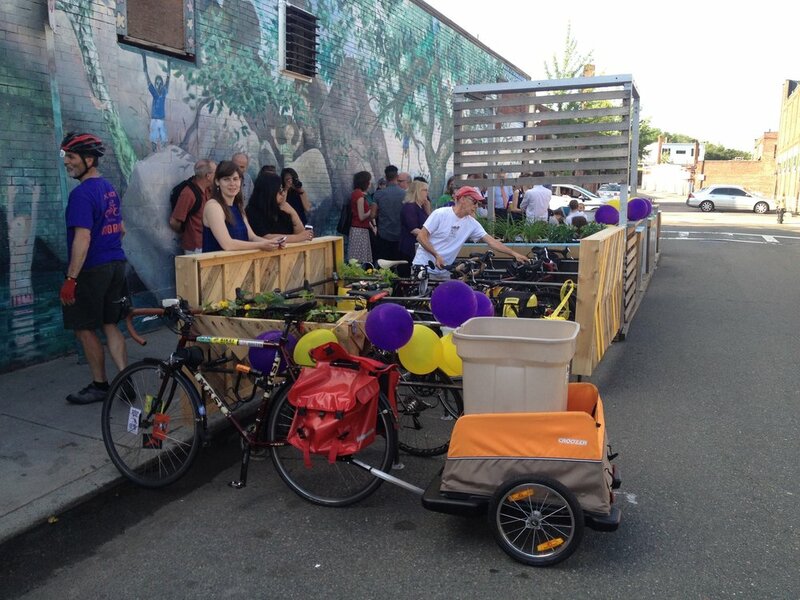 The Boston Society of Landscape Architects held a competition looking for tactical urbanism solutions and long term solutions for a particular intersection of the East Boston Greenway. My co-civic innovator, Thu Ngan Han, and I used the opportunity to do a quick design charrette and come up with some short term tactical solutions and long term adaptable solutions. We are eager for change, creative thinking, community action, climate awareness, and environmental appreciation. 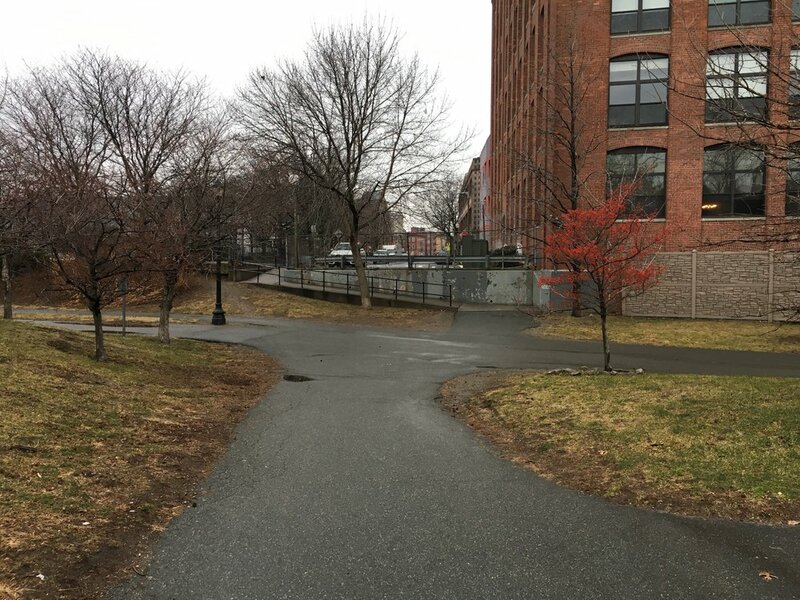 Before/current: A cold and rainy January day at the current state of the Gove Street entrance to the greenway. 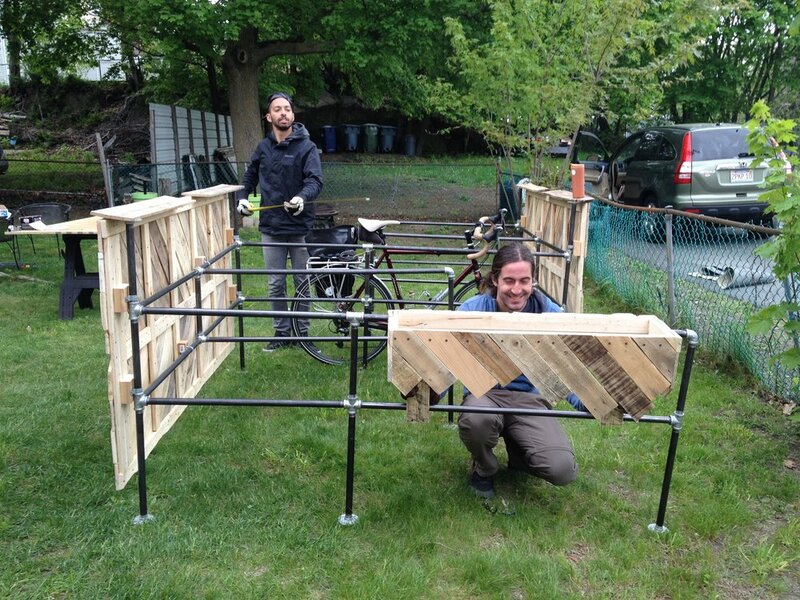 (en)gauging the water combines art, science, exploration, observation, and play. The design performs multiple functions and creates a new destination post-storm. Interactive rain gauges are built into the railing. The ramps gauge flood water, and act as a safety measure showing the water’s depth. Grates in the boardwalk allow passers-thru to peer into the landscape below and let light filter to the water-absorbing plants. A weather station installed on the light post can be a new member of CoCoRaHS (Community Collaborative Rain, Hail, and Snow Network). Visitors participate by taking pictures of the filled rain gauges and the flooded boardwalk, posting with hashtags like #weatherbridge or #(en)gaugingbridge. This short term, tactical vision, focuses on cost-conscious, low maintenance solutions. 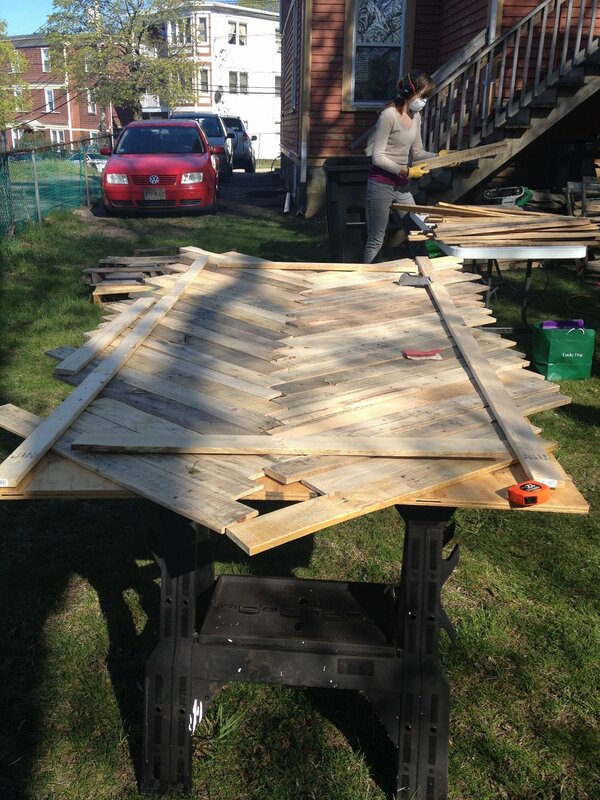 A simple ramp is constructed out of local rot resistant wood or plastic composite. Paint enlivens Gove Street for a temporary new gathering space. The greenway planting mix is low maintenance and drought tolerant that can handle short periods of being inundated with water. The plant mix provides all-season interest and food for wildlife. 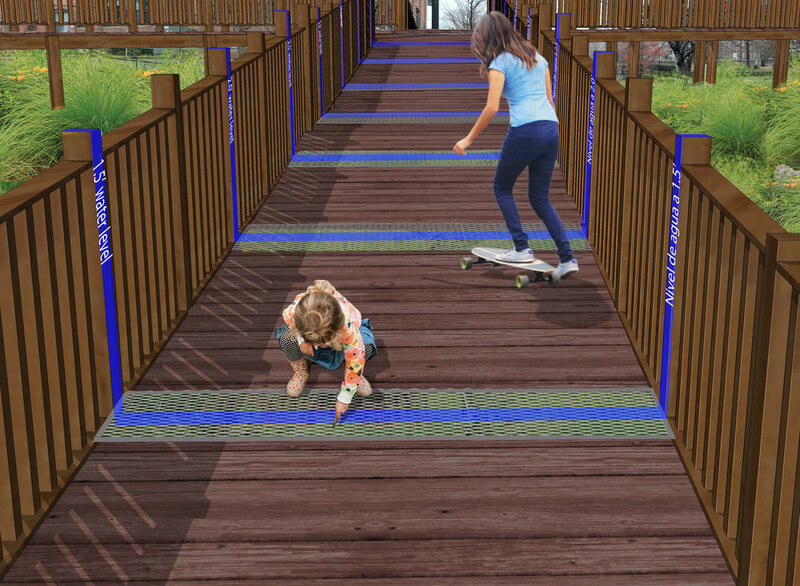 The long term, adaptable solution expands the bridge into a platform, creating a new place that encourages pop-up events like farmers’ markets, concerts, etc. Vignette: Custom sized rain gauges made for Boston’s 2, 5, 10, 25, 50, 100 year storm events can be built into the railing. This place can become a new destination after a storm to see how everything filled up! This project is exciting to me in a few ways - the first being that something will be built! (Note: winners have not been announced yet.) 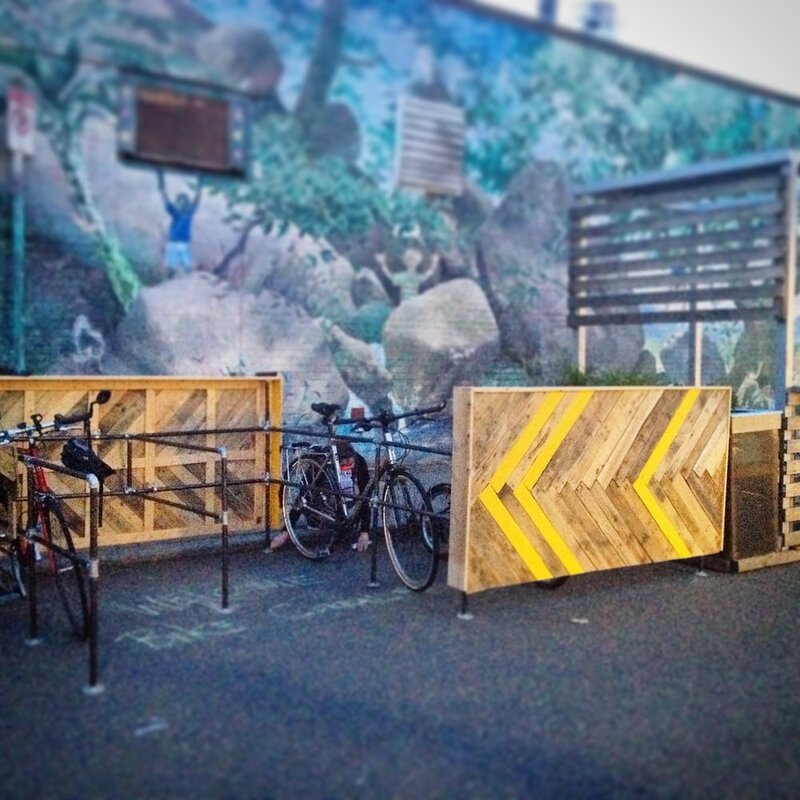 This is why I like tactical urbanism - you can see results fast! Another reason is that I’m a water and weather nerd. 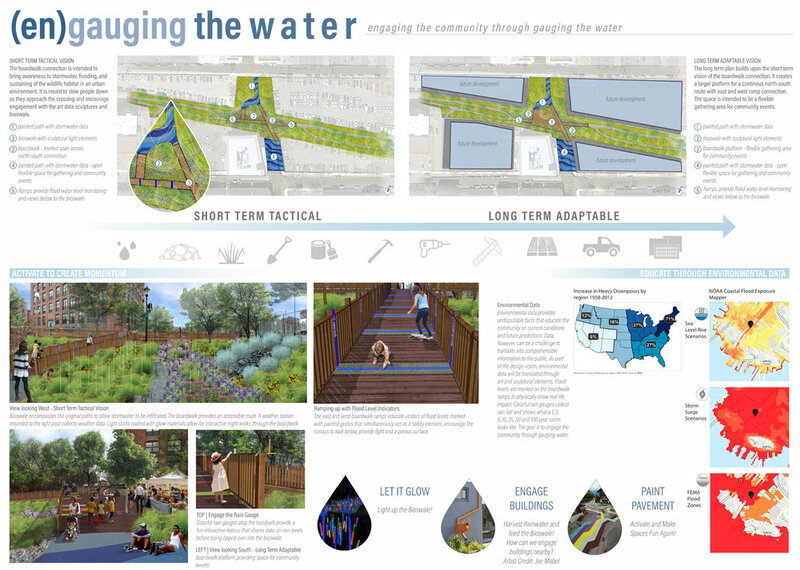 So to be able to think about how to combine weather science, data, art, stormwater management, landscape, architecture and placemaking in one project?! This is very exciting. And it gives me an excuse to learn about new (to me) resources and websites like the CoCoRaHS folks and NOAA folks kindly told me about where to find the rainfall amounts that define those storm events here. Vignette: Bridge as flood gauge. As the greenway floods, the bridge can tell you how deep it is (in English and Spanish!) this both acts as a safety measure and lets the curious peer through the grate at each marking to see how the bioswale plants are doing below. After: Bridge cross section. The path is now filled with native, water absorbing plants such as joe pye weed, little blue stem, bearded iris’, and others. The water level markers are seen marked in blue on the ramp. A weather station is mounted to the existing light pole. The Short Term Tactical Plan proposes a simple bridge spanning the flooding gap. Painted concrete frames the main entrances to the greenway and the ramps leading to the bridge mark the water levels. The Long Term Adaptable Plan expands the bridge into a platform for markets, concerts, outdoor classroom space and flexible gathering space. This plan anticipates new buildings on the existing parking lots (shown in blue/grey). Here is our final board submission. Comments? Thoughts? Would you come to see how full the rain gauges are after a storm? What else would you like to see here? Put a curb cut and new crosswalk on it! After: Curb cut and colorful crosswalk to make the crossing safer. Why does the Southwest Corridor crosswalk and curb cut at Amory Street not align with the entrance? Can we please provide easier access? It's dangerous for cyclists and strollers as designed, because when exiting the trail, the narrow sidewalk does not allow a full perpendicular alignment to the road, so they are unable to easy see if traffic is coming from both directions. I wonder how long it would take to get this fixed? Months? Years? See below for the existing crosswalk. Existing: Here's the state of the crosswalk today, about 35' to the right of the existing Southwest Corridor entrance. It needs to be repainted and we need to add another at the entrance! 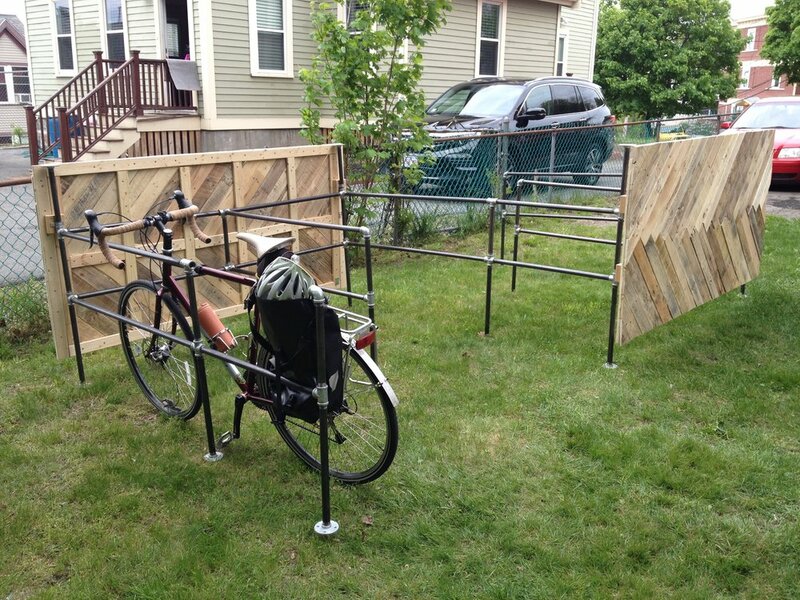 Put a parklet on it! 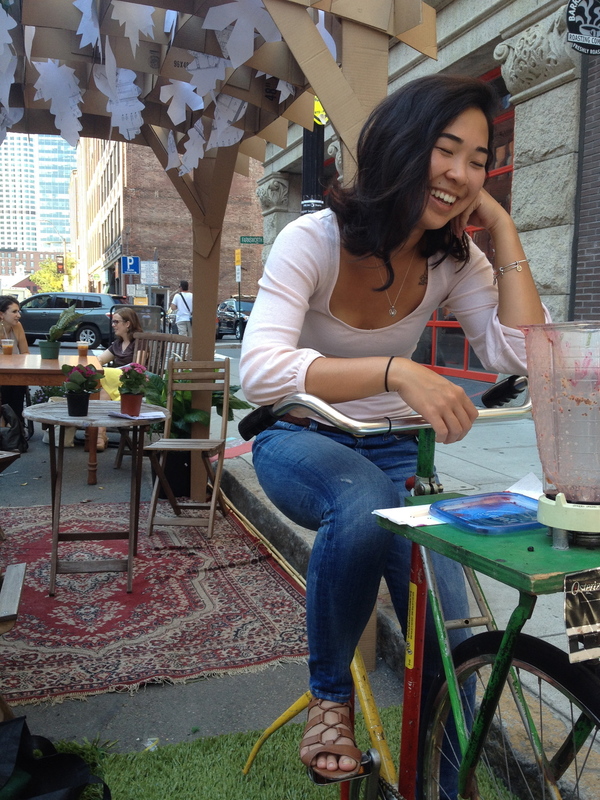 Ngan sits on Bike Not Bomb's smoothie blending bicycle on Congress Street in Fort Point. 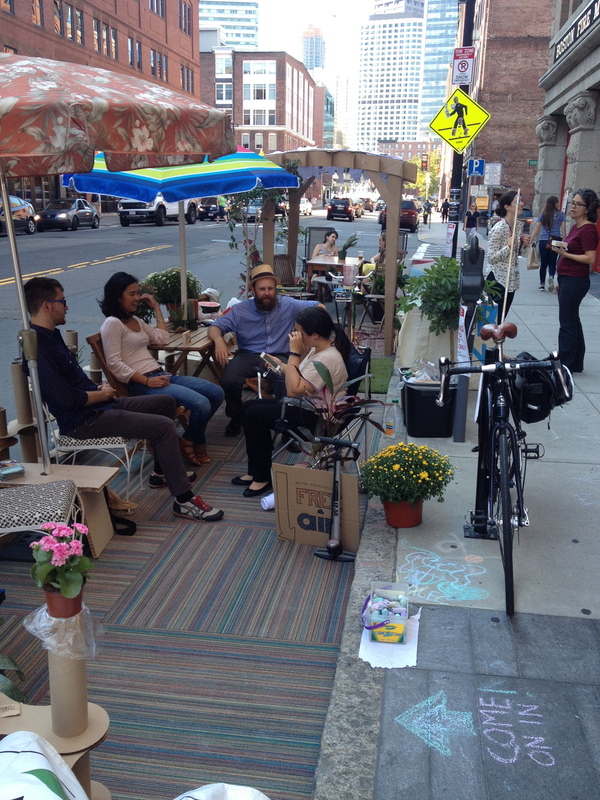 Thanks to some generous folks, we pulled off a successfully borrowed and hand-made PARK(ing) Day! 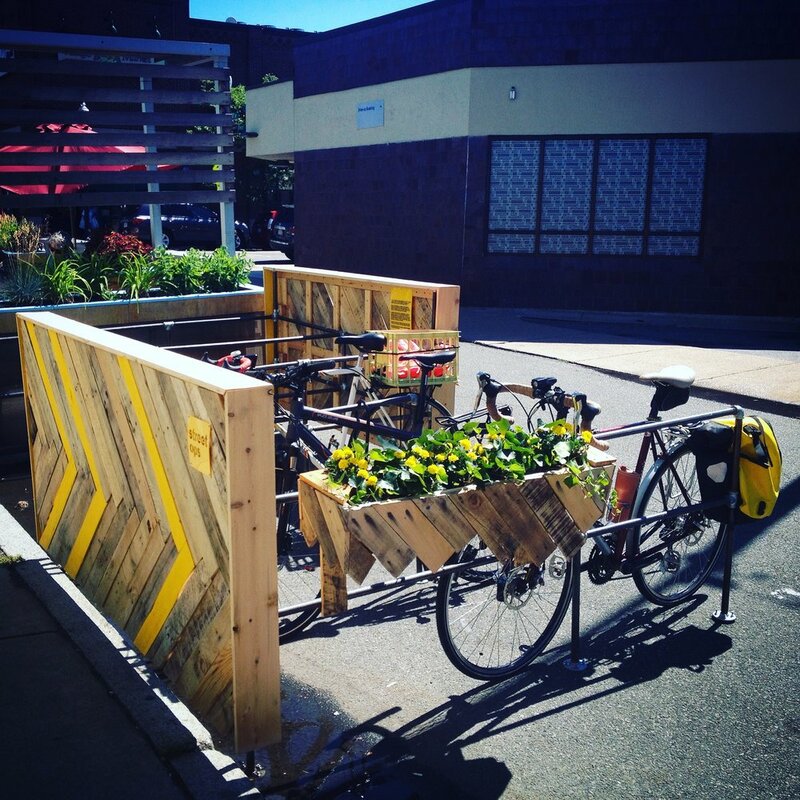 The Boston Gardener let us borrow 30+ plants for the day, a new bike-commuter friend lent his van for transporting plants, the Bike Not Bomb's smoothie bicycle (Biciblender) and coworkers at Stantec let us borrow their chairs, umbrellas, rugs, and time! Thanks to Stantec for paying for the moving permit that helped us secure the spot. 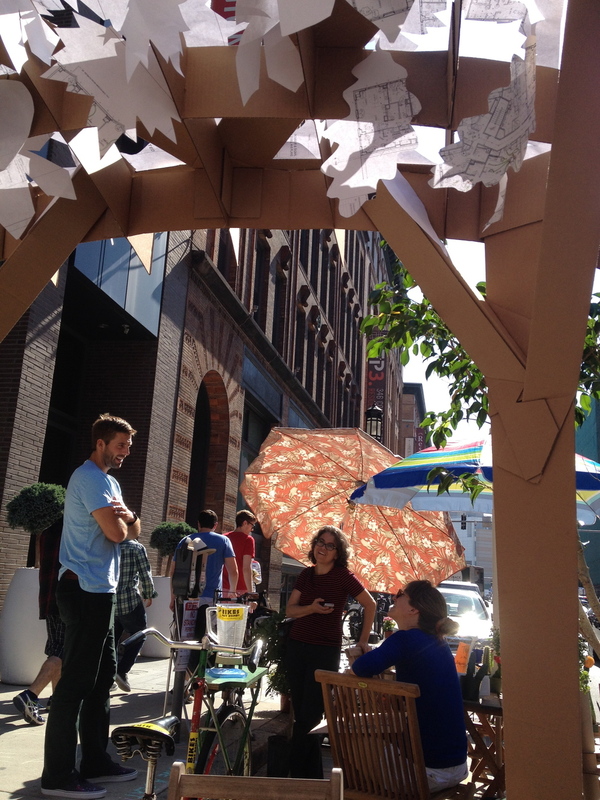 Thanks to Sketchup, Autocad, and a laser cutter, we made a sturdy cardboard canopy (with recycled-drawing leaves flapping in the wind), as well as a bike-chain-esque mini barrier to define the street edge. 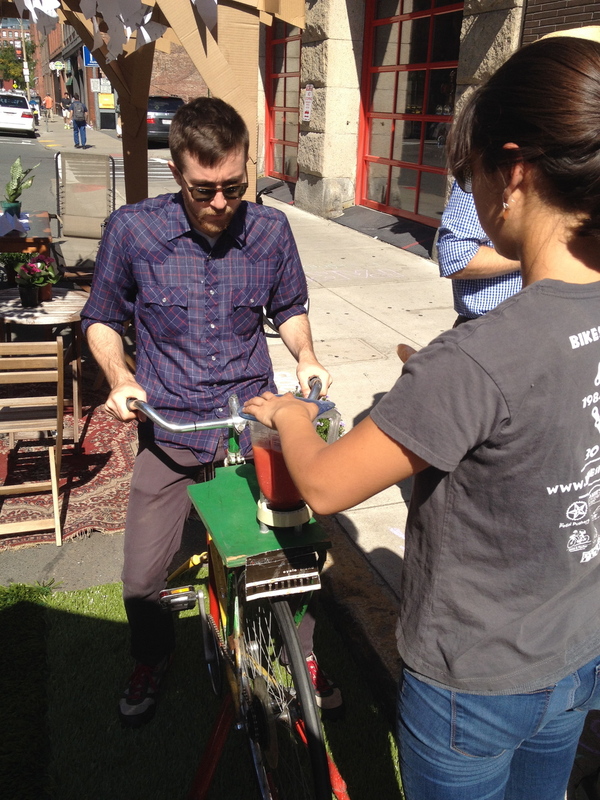 Thank goodness for the shade of the umbrellas and the donated fruit to power the biciblender bike for 5 HOURS and 160 smoothie servings! 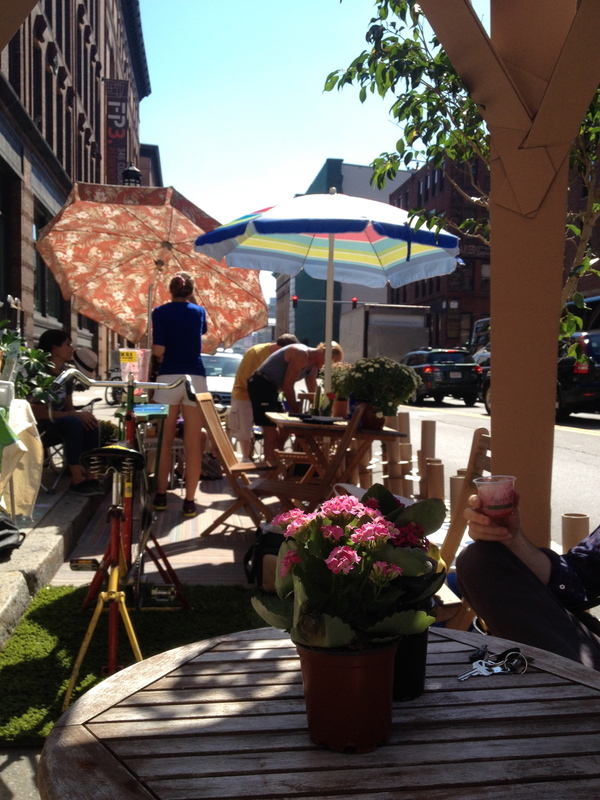 This is my fourth year doing PARK(ing) Day and I learn something every time. 1. You need sidewalk chalk to write messages to steer people into the seats. People don't understand they can really sit there. 2. You need a central activity/something out of the ordinary to pique people's interest and wiliness to stop and investigate. (Free smoothies are perfect for this.) 3. You need plants. No matter what. Their presence transforms space. Just like that. 4. Cardboard is a very versatile material. It's a challenge to work with in some ways, but plentiful in an architecture office, and its useful life should be prolonged for as long as possible. 5. 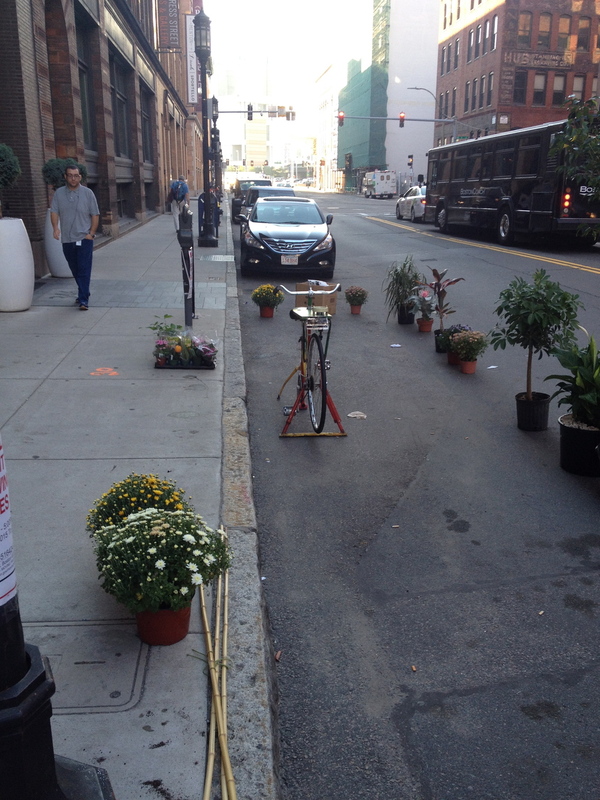 There will always be nay-sayers when it comes to PARK(ing) Day. 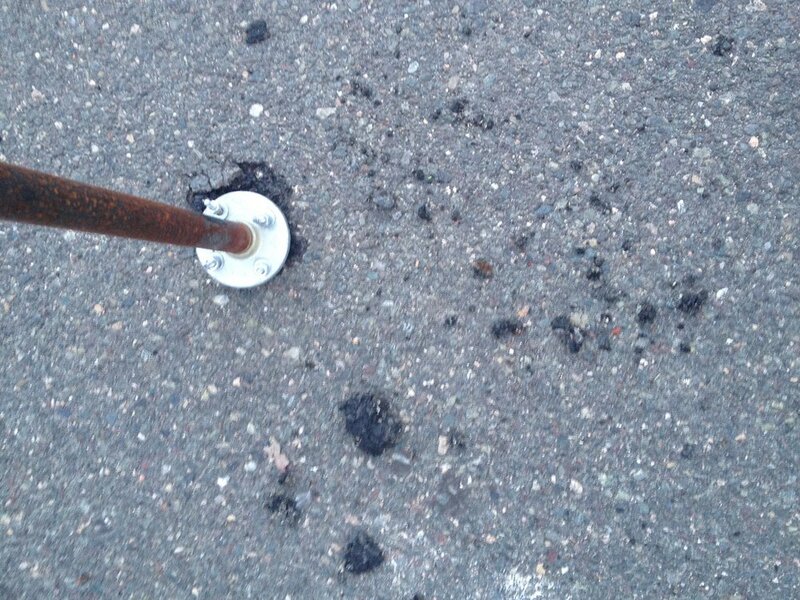 One neighborhood guy said: You cannot put a park there (as we were cleaning up at 5pm). I said: I just did. (And we had a permit.) Perhaps I should have invited him to take a seat in our shade earlier to convince him. Just brush those guys off. The day positively affected so many people. 6. Watermelon offerings can make amends. 7. People are generous. 8. It's fun giving away things for free and making people happy. 9. 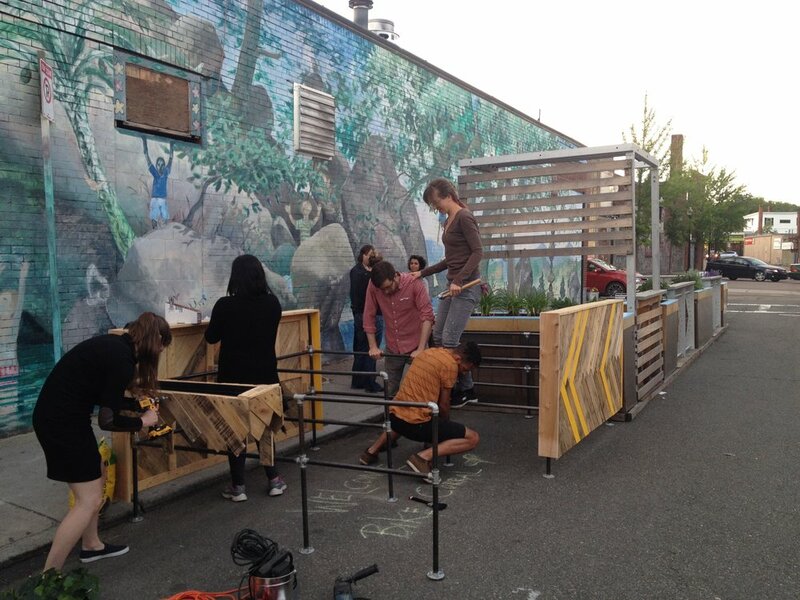 Productive work meetings are more pleasant in a parklet. 10. Build it and they will come (again and again, 3 times in one day for some locals down the block). 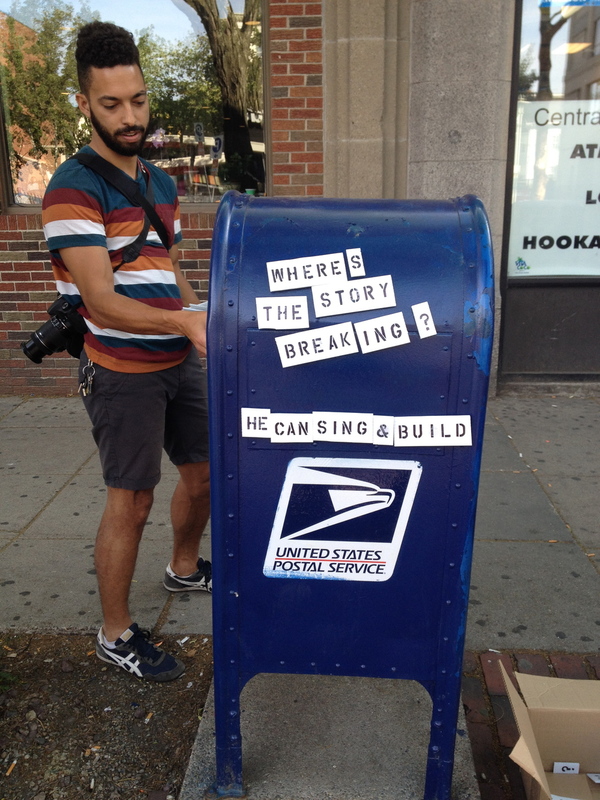 Put poetry on it! These guys were diggin it.